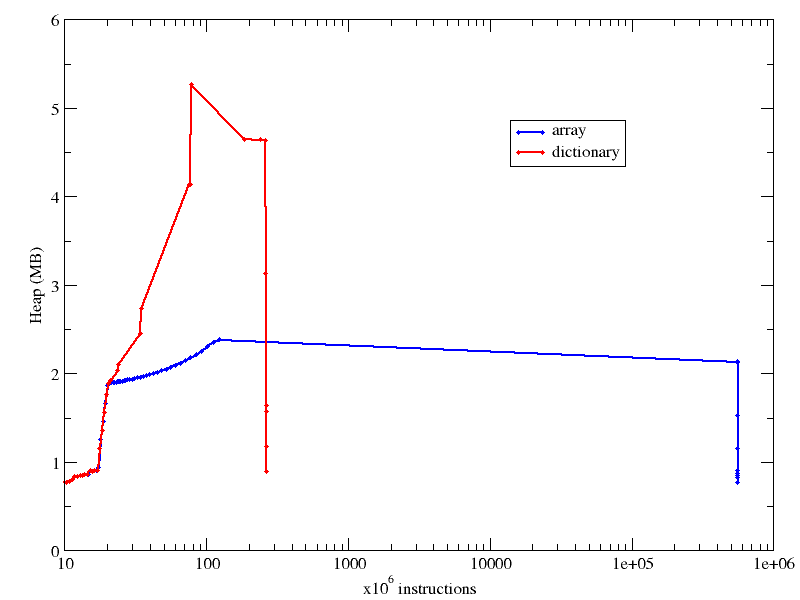 I guess this post is not going to reveal anything new: testing for an item's membership in an array is slow, and dictionaries are much more CPU-efficient for that (albeit more RAM-hungry). I'm just restating the obvious here, plus showing some benchmarks. The above construct works regardless of "collection" being an array or a dictionary. However, the search for "item" in "collection" is different internally. In the case of a list, Python checks all its elements one by one, comparing them to "item". If a match is found, True is returned, and the search aborted. For items not in the list, or appearing very late inside it, this search will take long. However, in the case of dictionaries, the search is almost a one-step procedure: if collection[item] returns something other than an error, then item is in collection. Both scripts accept (require) an integer number as argument, then build item collections of this size (initialization), then run the check loops. The loops are designed to look for every item of collection 1 in collection 2 (and all checks will fail, because no single item belongs to both sets). Bear in mind that the computer was not otherwise idle during the tests. I was surfing the web with Firefox and listening to music with Amarok. Both programs are CPU- and (specially) memory-hungry, so take my results with a grain of salt. In any case, it was not my intention to get solid numbers, but just solid trends. The above outputs heap MB vs million executions. 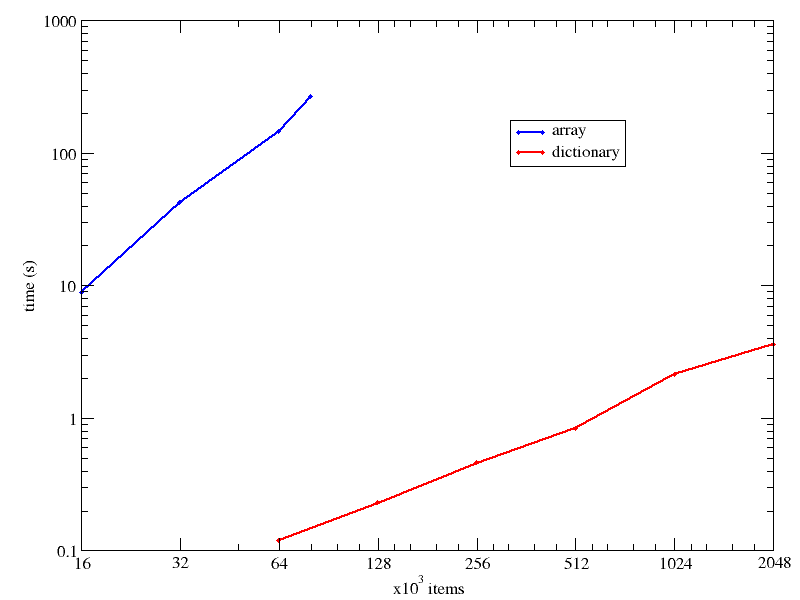 At 64k items, the dictionary search is already 3 orders of magnitude faster, and the difference grows fast as the collection size increases. 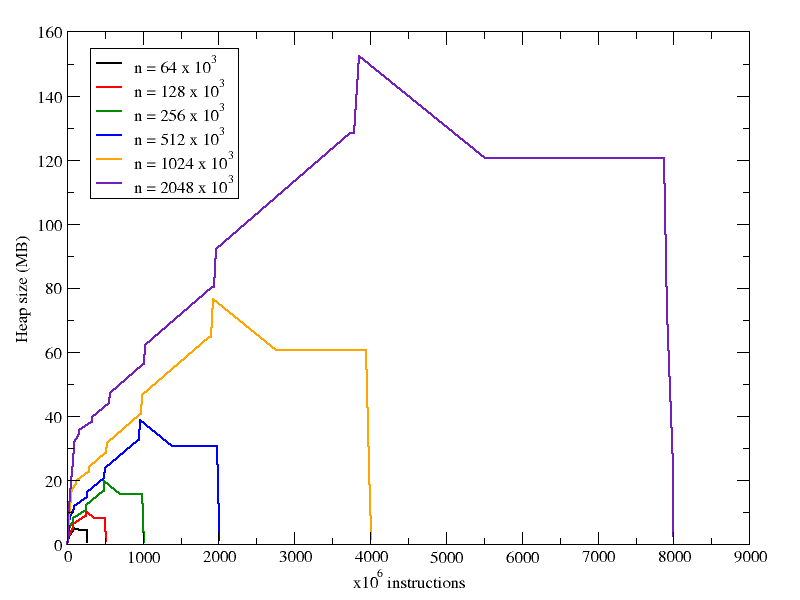 With respect to memory use, we can see that in both cases increasing nitems increases the heap size, but in the case of the arrays, the increase is not so pronounced. 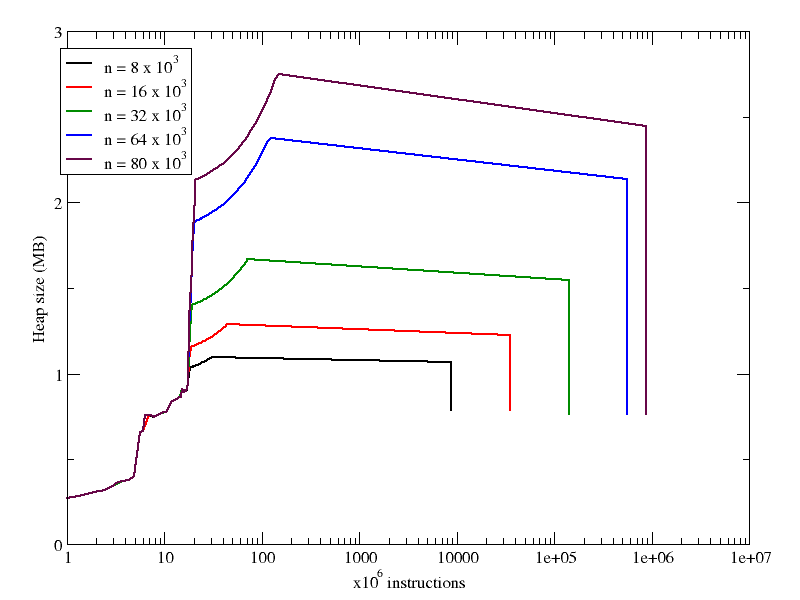 Looking at the X axes in both following plots, you can see that the number of instructions executed during the run grows linearly with the number of items in the collection (recall that the array plot has a logarithmic X axis). It wasn't really an easy task, because I had to combine the biggest array case I could handle with the smallest dictionary the timing of which would be meaningful (smaller dictionaries would be equally "immediate", according to time). Also notice how the X axis has a log scale. Otherwise the number of instructions in the array case would cross the right border of your monitor. The music loving community may rejoice, ogg2mp3 is out! OK, OK, that is too much to say, but nonetheless someone could find it useful. ogg2mp3 is a simple Python script I have made to make the task of converting OGG files to MP3 and the other way around easier. There might be other (better) tools out there for the same task, but I had some need, and this script fulfills it. ogg2mp3 can convert single files, lists of them, or even whole directory contents, and reads the ID3 tags of the input OGG/MP3 files, saving them into the output MP3/OGG. I basically convert bunches of OGG files to MP3 when I want to put them in portable players that don't read OGG. I do the opposite when someone passes me an MP3 and I want to add it to my collection, which is in OGG format. I figured out that the contribution to distributed computing projects could be a reasonable indicator of the Windows predominance status. There are many other indicators (for example the number of visits to a web site, e.g. this very one), and I don't claim that this one is "better". I just want to add it to the reference list for the reader. There is a problem with "Windows vs. Linux" figures, and it is that they are not really "competing" products. When cars or soft drinks are the subject, one can figure out the market share, looking at the number of items sold. Linux being free software, one can hardly measure the amount of "sold copies", and with Windows being pre-installed in most new computers, one can not really trust the "number of computers sold = number of Windows copies sold", because some users even remove the Windows partition and install Linux on top of it. Counting the visits to some sites is not without problems, either. Any web site will have a particular audience, and the result will be biased by that fact. When my blog was in WordPress.com, I had roughly as many visits from Windows users as from Linux users, and almost all of them used Firefox as a browser. Obviously this data is not an accurate reflection of the world at large. It so happened that free software users are more likely to surf to sites like mine, hence the bias. What the plot tells us is that (at the time of writing this) 500 million cobblestones are being granted to contributors each day. Of them, around 82% are being given to Windows computers, 9-10% to Mac, 8% to GNU/Linux, and the rest to computers running other OSs.